It is now commonly asserted that climate change will fundamentally change international relations. It has been predicted that global warming will increase conflict within and between states, intensify food insecurity, menace the global trading system and unleash waves of migration. As a result governments are beginning to incorporate these warnings into their foreign policy initiatives. The appropriateness of their incipient responses needs to be examined in finer detail. 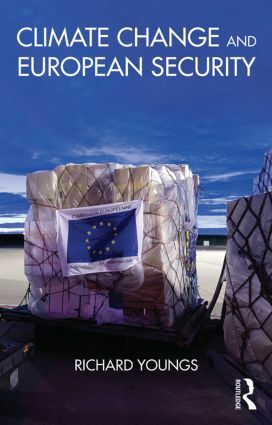 This book looks at the impact of climate change on European Union (EU) security policy. It explores how governments are reconfiguring their geo-strategy and broader international relations in the wake of climate change warnings. The book demonstrates that although many aspects of EU foreign policies have begun to change, ‘climate security’ is not yet accorded unequivocal or sufficient priority. In doing so, Youngs argues that if climate change policies are to have significant effect they can no longer be treated as a separate area of policy but must be incorporated into the more mainstream debates pertinent to EU common foreign and security policy (CFSP). This book will be of key interest to students, scholars and practitioners of climate change and policy, energy and environmental policy, EU governance and foreign policy, European studies, international relations, geography, security studies/policy and environmental economics. Richard Youngs is Senior Associate, Carnegie Europe and Professor of International Relations at the University of Warwick, UK.